In that spirit, she and her husband Andrew host around 200 friends each year at their “Kirkwood Lovefest.” Martha starts planning for the party before Christmas, setting the year’s theme and designing invitations. “One year it was all heart piñatas, one year was balloon sculptures, one year bubble machines.” Last year, it was papel piquado, the colorful Mexican cut-out paper. Sounds traditional enough. But Martha is quick to point out, “It’s not a Valentine’s party. It’s a ‘Lovefest’ all about love. You know I just have a crazy mind.” Meaning crazy creative – and also hilarious. The afternoon before Lovefest, movers transport all the furniture in the family’s living room to the garage. “I put all the couches I can fit in our breakfast room, and that’s the ‘Love Lounge,’” Martha says. A tent in the backyard holds dinner tables. In the family room, where she puts the dance floor, Martha sets up the “Love Library,” which she describes as “a romantic library of books. It’s funny – the later the night goes, the less reservations people have about browsing through those books. “But all that has to be boxed and taped up that night and hidden away for the rest of the year because God knows you don’t want to be caught with that!” she says. Speaking of being caught, this is a grown-ups-only party. The Kirkwood kids get “farmed out with the same friends every year, who of course are coming to the party,” Martha says. But that doesn’t mean the kids don’t have their own fun. 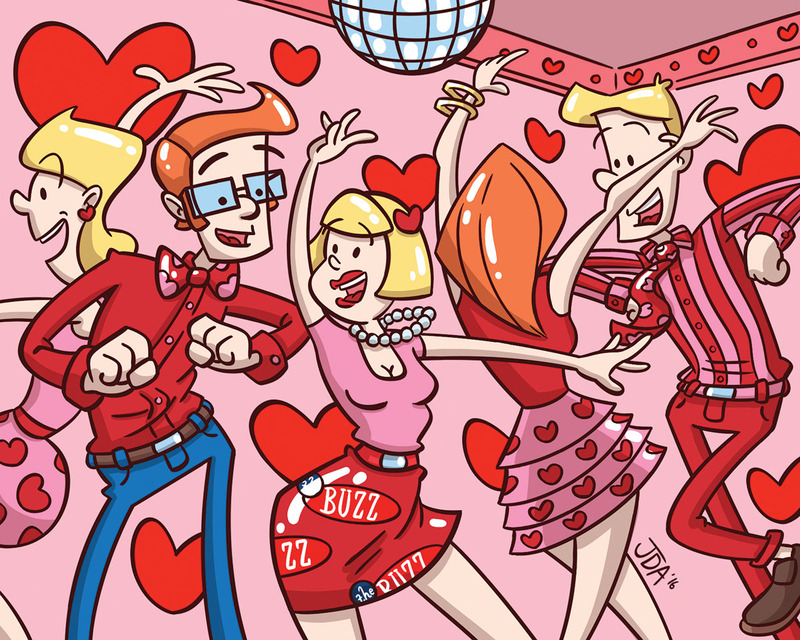 “The night before the party, I have a neighborhood Valentine’s party. We order pizza and turn music on. For Lovefest, Martha hires a DJ and sends him a list of her “must-plays” – think Sister Sledge’s We Are Family, Madonna’s Dress You Up and Chaka Khan’s I Feel for You. By Sunday noon, when the Kirkwood kids come home, movers have come and gone, and everything except the disco ball hook in the family room ceiling is back in place. What about the hook? “It’s my [year-round] reminder of the fun to come!